Similar ulcers can occur in bit of intestine just beyond the stomach, known as duodenal ulcers. Both stomach and duodenal ulcers are sometimes referred to as peptic ulcers. Here the term “stomach ulcer” will be used, although the following information applies equally to duodenal ulcers. The most common symptom of a stomach ulcer is a burning or gnawing pain in the centre of the abdomen. Stomach ulcers are common. Stomach ulcers can affect people of any age, including children, but mostly people aged 60 or over. Medication can be used to treat stomach ulcers. A type of medication known as a proton pump inhibitor is usually used to reduce the amount of acid in your digestive system, allowing the ulcer to heal. If an H. pylori infection is responsible for the ulcers, a combination of antibiotics can be used to kill the bacteria and this will prevent the ulcer coming back. If the ulcers are related to the use of NSAIDs, NSAIDs are usually stopped and the ulcer is healed using proton pump inhibitors. In the case of aspirin-induced ulcers the aspirin sometimes needs to be continued, depending on the reason it is being given. Dr. B C Shah will advise you on your particular case. Complications of a stomach ulcer are uncommon, affecting around 1 in 50 people. Some of these complications are regarded as medical emergencies, although they are rarely life-threatening. Older people aged over 70 are most at risk of experiencing a fatal complications of a stomach ulcer. If the underlying causes of a stomach ulcer are addressed, the ulcer usually goes away after treatment. However, new ulcers can sometimes form so it’s important to address the underlying cause of any ulcers. The most common symptom of a stomach ulcer is a burning pain that develops in the upper abdomen or the centre of your abdomen. However, the pain can also travel up to your neck and down to your navel (belly-button). The pain can last from a few minutes to a few hours. If you have an ulcer in your stomach, you may find that the pain starts soon after eating a meal. If the ulcer is in your small intestine (duodenal ulcer), the pain may start two to three hours after eating so it may wake you up during the night. Eating more food and taking antacids (indigestion medication) can often help relieve the pain of a duodenal ulcer, but not usually the pain of a stomach ulcer. Stomach ulcers often do not cause typical symptoms and occasionally they do not cause any pain at all. Which means it is possible to get a complication such as bleeding without feeling pain beforehand. You should always visit Dr. B C Shah if you suspect that you have a stomach ulcer. While there are treatments available over the counter from pharmacies that provide temporary relief, they will not treat the underlying causes. The stomach produces acid to digest food. The lining of the stomach is coated with mucus, which protects the lining from the harmful effects of the acid. H. pylori and NSAIDs can break down the stomach’s defence against acid, allowing the acid to cause an ulcer. Even though most people with ulcers are not producing too much acid, blocking the acid will allow the ulcer to heal and then the cause of the ulcer can be removed to prevent it coming back. Helicobacter pylori (H. pylori) infections are very common, and it’s possible to be infected without realising it because the infection doesn’t usually cause symptoms. It is not known why some people are vulnerable to the effects of H. pylori when the majority of people are not. However, smoking is a major risk factor that people can do something about. Also, stomach ulcers are known to run in families, so there may be genetic factors that make certain people more sensitive to H. pylori. Some strains of H.pylori are more damaging than others. Some people with cardiovascular disease (conditions that affect the heart and the blood) also take aspirin on a regular basis because it can reduce the risk of blood clots which can cause heart attacks and strokes. Because of the risk of getting stomach ulcers, you may be advised not to use NSAIDs if you currently have a stomach ulcer or if you have had one in the past. Paracetamol can often be used as an alternative painkiller as it is safer. However, there may be cases where the benefits of taking NSAIDs is thought to outweigh the risk of developing stomach ulcers. For example, if you have recently had a heart attack, low-dose aspirin may be required to prevent you having another one. In such circumstances, a medication called a proton pump inhibitor (PPI) can be used to reduce the amount of acid in your digestive system, which should help prevent ulcers from forming and reduce the risk of complications. 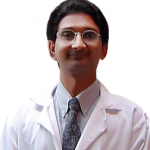 Dr. B C Shah may suspect that you have an ulcer based on your symptoms. In most cases they will then either treat you with an acid-suppressing medication or test for H. pylori and treat it, or both. You may be referred for an endoscopy to look inside your stomach directly to see whether you have a stomach ulcer. The procedure (called a diagnostic gastroscopy) is carried out in hospital and involves passing a thin, flexible tube (an endoscope) with a camera at one end into your mouth, through your gullet and into your stomach and duodenum. The images taken by the camera will usually confirm or exclude an ulcer without the need for further tests. During the procedure Dr. B C Shah may also take a tissue sample from your stomach or duodenum. The sample can then be tested for the H. pylori bacteria. A diagnostic gastroscopy isn’t painful but some people find the experience uncomfortable. You can have your throat numbed with a local anaesthetic spray or you can be sedated. Sedation makes you very drowsy so that you have little or no awareness of the gastroscopy being carried out. If you choose to have sedation, you will need to arrange for someone to give you a lift home after the procedure and to stay with you for at least 12 hours afterwards. If you decide to have a local anaesthetic, you can leave hospital as soon as the procedure has been completed. You can resume normal activities within one-to-two hours. If Dr. B C Shah thinks that your symptoms may be due to an H. pylori infection (which would usually be the case if you don’t have recent history of taking non-steroidal anti-inflammatory drugs), you may need to have one of several possible further tests. These are described below. A urea breath test – you will be given a special drink that contains a chemical that is digested by H. pylori. Analysis of your breath after having the drink indicates whether or not you have an H. pylori infection. A stool antigen test – a pea-sized stool sample will be tested. A blood test – a sample of your blood will be tested for antibodies to the H. pylori bacteria. Antibodies are proteins that are produced naturally in your blood and help fight infection. If you test positive for H. pylori, you will need treatment to clear the infection. This can heal the ulcer and, even more importantly, prevent it from coming back. If you have a stomach ulcer, your treatment will depend on whether the cause is an H. pylori infection, non-steroidal anti-inflammatory drugs(NSAIDs) or both. If your stomach ulcer is caused by an H. pylori infection, a course of antibiotics is recommended. This is known as eradication therapy because it will kill the bacteria. If your stomach ulcer is caused by NSAIDs and you don’t have a H. pylori infection, a one-to two-month course of proton pump inhibitors (PPIs) are recommended. Your use of NSAIDs will also need to be reviewed and an alternative painkiller, such as paracetamol, may be recommended. If it is thought that your stomach ulcer is caused by a combination of NSAID use and an H. pylori infection, you will be given a two-month course of PPIs and a course of eradication therapy. An alternative type of medication, known as H2-receptor antagonists, are sometimes used instead of PPIs. Try to persist with treatment if you only have mild side effects. Stop if you have severe watery diarrhoea or an obvious allergic reaction. You will be re-tested at least four weeks after eradication therapy has been completed to see whether there are any H. pylori bacteria left in your stomach. If there is, you will be given a further course of eradication therapy using different antibiotics in combination with PPIs. Proton pump inhibitors (PPIs) work by blocking the actions of proteins called proton pumps, which are partially responsible for producing stomach acid. Reducing the amount of stomach acid prevents any further damage to your stomach ulcer, allowing it to heal naturally. H2-receptor antagonists work by blocking the actions of a protein called histamine, which is also responsible for stimulating the production of acid. All of the treatments discussed above can take several hours before they start to work, so it is likely that Dr. B C Shah will recommend some additional medication to help provide short-term symptom relief.. Both antacids and alginates are available to buy over the counter at pharmacies. Your pharmacist will be able to advise you about the types of antacid and alginate most suitable for you. Antacids are best taken when you experience symptoms or when you expect them, such as after meals or at bedtime. Alginates are best taken after meals. Don’t take these medications within an hour of taking proton pump inhibitors or ranitidine as they may block the effects. Bananas are also thought to provide a protective effect against stomach acid, so you may want to consider eating these as an alternative way to relieve your symptoms, if you don’t want to take antacids or alginates. If your stomach ulcer has been caused by taking NSAIDs, Dr. B C Shah will want to review your use of them. You will usually be advised to use an alternative painkiller that is not linked to stomach ulcers, such as paracetamol or a low-dose opiate-based painkiller. If you are taking low-dose aspirin to reduce your risk of getting blood clots, Dr. B C Shah will help you decide whether you need to continue taking it. In most cases it is continued or only stopped for a few days. In these cases a PPI is given as well as the aspirin to try to prevent further ulceration, and this is usually very effective. If you or Dr. B C Shah feel that the continued used of NSAIDs is absolutely necessary, you will be prescribed a long-term course of a PPI or H2-receptor antagonist. It is important that you understand the potential drawbacks and risks associated with continued NSAID use. You are more likely to develop another stomach ulcer and the risks of experiencing serious complications, such as internal bleeding, are higher. The introduction of eradication therapy means that complications of stomach ulcers related to H. pylori infections are now uncommon. Complications are more common in stomach ulcers that are associated with the use of non-steroidal anti-inflammatory drugs(NSAIDs). This is because these types of ulcers do not always cause any obvious symptoms, so are left untreated. It is estimated that around 1 in 50 people with a NSAID-related stomach ulcer will develop a complication. Internal bleeding is the most common complication of stomach ulcers and is responsible for around 3,500 hospital admissions in England each year. Internal bleeding can occur when an ulcer develops at a site of a blood vessel. Depending on the location and type of blood vessel, you may have long-term bleeding which could lead to anaemia (a condition where the body has a lack of oxygen-carrying red blood cells). People who have this sort of internal bleeding always need an endoscopy to identify the cause of the bleeding. Often bleeding can be stopped by treatment performed through the endoscope. Patients receiving this are kept in hospital and given injections of proton pump inhibitors (PPIs). Lowering the amount of acid around the site of the bleeding is thought to make the blood more likely to clot, which helps to stop the bleeding. Massive bleeding can be treated using blood transfusions to replace any blood loss. Surgery is occasionally needed to repair the blood vessels. 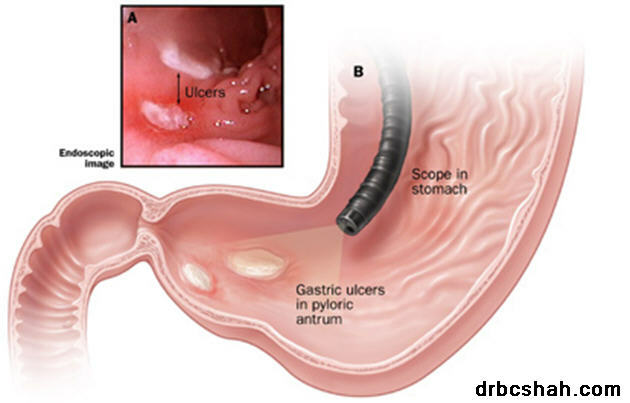 A rarer complication of stomach ulcers is where the ulcer causes the lining of the stomach to split open (a perforation). It affects around 1 in 350 people with a stomach ulcer. Perforation is potentially very serious because it enables the bacteria that live in your stomach to escape and infect the lining of your abdomen (peritoneum). This is known as peritonitis. The most common symptom of peritonitis is the sudden onset of abdominal pain, which gets steadily worse. Peritonitis is a medical emergency because the peritoneum doesn’t have an in-built defence mechanism for fighting off infection. It requires admission to hospital so that the condition can be treated with antibiotic injections to get rid of the infection. Surgery will then be used to seal the hole in the stomach wall. In some cases, an inflamed or scarred stomach ulcer can obstruct the normal passage of food through your digestive system. This is known as gastric outlet obstruction. Gastric outlet obstruction is relatively uncommon. Each year, it affects around one in a 1,000 people with a stomach ulcer. An endoscopy will confirm the type and site of the obstruction. If the obstruction is caused by inflammation, PPIs or H2-receptor antagonists can be used to help reduce it. If the obstruction is caused by scar tissue, surgery may be needed to treat it, although sometimes it can be treated by passing a small balloon through an endoscope and inflating it to widen the site of the obstruction. In more severe cases of scarring, it may be necessary to surgically remove the affected section of stomach, before reattaching the remainder of the stomach.